Planning a getaway with your family? Be prepared prior to departure! "Are we there yet?!" Be sure to share how long the trip might take, what might happen along the way and things the little ones should expect. Check schedules of the places you plan on visiting, there might be special programming on certain times of the day that would be perfect for children. Also, sometimes attractions have funny open and closing times, knowing in advance can save heartbreak if your little ones are expecting to do something and the place is closed. Be prepared! If you know that you have a layover in the airport or a long car ride then have activities and snacks ready. Movies and phone/tablet apps are great ways for kids to stay busy and not bored. Find activities that appeal to all ages. If you are traveling with a few different age ranges the ideal attraction for a toddler may bore your 10 year old. Find things that the whole family can enjoy together! Be sure to plan breaks and quiet time throughout the trip. Nothing good can come from pushing kids for 10 hours without stopping! Be sure to set aside time for naps and quiet time. Be sure to enjoy the trip as a family! Stop and enjoy those little moments you will cherish down the road. Take that family picture that you will look back at in 10 years and smile (maybe even shed a tear at the memory) and put it on display when you get home for the whole family to enjoy! Families looking to stick their toes in the sand, will love Jacksonville’s white, sandy beaches and Atlantic Ocean waters. Get active with your teens and rent a surf board and hit the waves, or take kiteboarding lessons, rent kayaks and paddleboards. Kids of all ages will love to watch fishermen at Jacksonville Beach haul in a catch from the surf. The Sea Walk Pavilion, in Jacksonville Beach, is the spot to look for festivals, outdoor movies and live music performances year round. Explore the outdoors and the beaches at one of the area’s unique oceanfront parks. Big Talbot Island offers its family photo worthy Boneyard Beach, as well as hiking trails and guided kayak tours offered by Kayak Amelia. Kathryn Abbey Hanna Park has mountain biking trails, fishing ponds, dog-friendly beaches, a seasonal splash park, hiking trails and a playground. 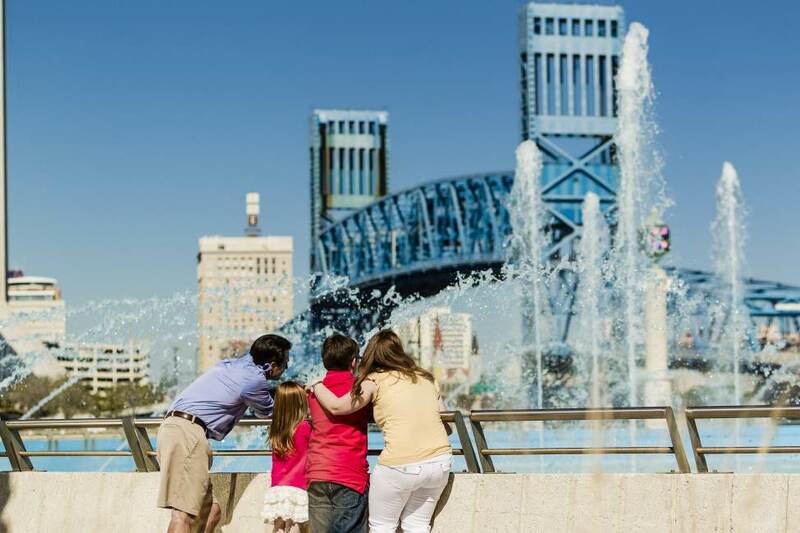 Not too far from the ocean, families can spend an entire weekend in Downtown Jacksonville. There are hotels overlooking the St. Johns River, museums and a variety of activities for the entire family. The Museum of Science and History (MOSH) is a signature family attraction on the St. Johns River. MOSH offers hands-on displays, live animal exhibits, historical artifacts and the area’s only planetarium. The Florida Theatre and the Times-Union Center for the Performing Arts regularly host family-friendly shows and the Jacksonville Symphony Orchestra often displays a musical “petting zoo” for children before such performances. Kids can pick-up and play a variety of instruments that they will later hear the orchestra play. Sweet Pete's and Peterbrooke offer locally made candies and factory tours. Transportation options in Downtown offer entertainment for young visitors too. Take the free Skyway for a view of the river or to visit the Jacksonville Public Library in Hemming Park. It boasts regularly scheduled, free programs for kids of all ages. Jacksonville’s affordable water taxi is a great way to sneak in a boat ride and will take you to the iconic Jacksonville Landing where you’ll find the ever popular Toy Factory and several restaurants to choose from. Just outside Downtown Jacksonville, there are charming historic neighborhoods with tree lined streets perfect for strolling or biking, as well as cultural activities at every turn. The Riverside neighborhood is home to the Cummer Museum of Art & Gardens, featuring impressive waterfront gardens, a world-renowned art collection and the hands-on Art Connections activity center. Next door, visitors will find the free, weekly Riverside Arts Market, held on Saturdays from 10 a.m. to 4 p.m. Here you’ll find local families playing and enjoying their Saturday morning, and there is also a kids’ activity featured every week. There is a selection of unique local art pieces, live music, street foods and fresh organic produce to buy. Minutes from Riverside are the Shoppes of Avondale and across the river you’ll find San Marco. San Marco is home to the original Peterbrooke Chocolatier. Stop in to sample their famous chocolate covered popcorn. The Jacksonville Zoo and Gardens is consistently ranked as a top animal attraction. Its wide open spaces give the animals plenty of room to roam and families plenty to see and do. Feed the giraffes, ride the train around the entire zoo, wander through immaculate Asian Bamboo Gardens and get up close and personal with tigers at the brand new Land of the Tiger. Head to Adventure Landing for go-karts, mini golf, an arcade and more. The Jacksonville Beach location is home to Shipwreck Island Waterpark. Perfect for older children is Dave & Buster’s, packed with arcade games, and Latitude 30 featuring a bowling alley, arcade and entertainment zone. Families will find the hottest retailers, as well as unique local shops and restaurants to satisfy every taste and budget at the St. Johns Town Center. The open-air mega mall is a must-see when visiting the area. The Avenues Mall is also a popular shopping destination. Both malls offer a play spot for the littlest visitors. Root, root for the home team! For the family that cheers the loudest together, Jacksonville is a sports-crazy town. We are home to the NFL’s Jacksonville Jaguars, the Jacksonville Armada FC (soccer), minor league baseball team the Jacksonville Jumbo Shrimp, the Jacksonville Sharks arena football team, rugby team the Jacksonville Axemen and many others. Families can relax in comfort in hotels at a variety of price points, from Downtown high-rises and oceanfront resorts to more budget-friendly options. Look for special rates, packages and deals to caterer to your family’s needs. Resorts offer kids programs for all ages, and many value hotel destinations offer special rooms for families – from bunk beds to connecting suites for large families or those traveling with multiple generations.